O Spring, where art thou? If you're familiar with the Midwest, then you know Spring trickles in at about the pace it takes a giraffe to have a baby (which means painstakingly slow for those of you who have been living under a rock). I don't know about you but I'm ready to invite the excitement of the pending season inside. Screw Mother Nature and let's start spring decorating! update your home with ease! Before we jump into these seasonal goodies, let me first say that a recipe for instant spring does not need to cost a fortune! 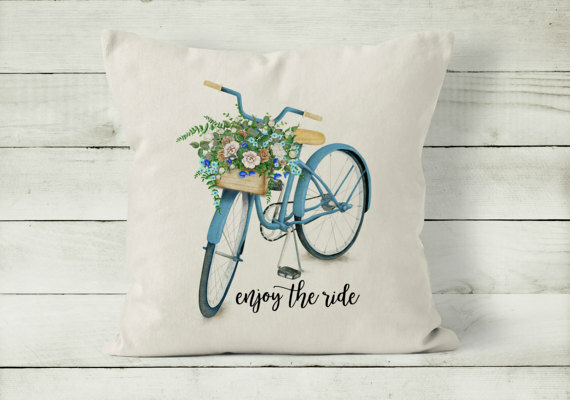 4 to 5 years ago I use to think welcoming spring into your home meant ONLY decorating with Easter-themed decor and that I needed to change almost EVERYTHING for the new season. This was during the time Charlie Sheen had a mental breakdown, so obviously a lot of us were not thinking straight back then. Tip #1: Avoid purchasing Easter-specific decor that will only adorn your house for a few weeks and instead spend your money wisely on items that can stand the test of time. 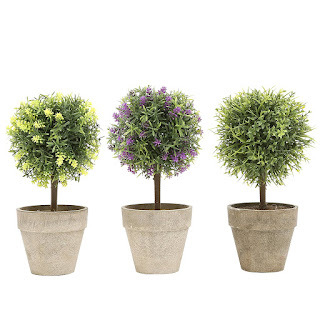 Topiaries for example, scream spring and summer. You can even incorporate them into your holiday decor by adorning them with little ornaments or a string of white lights. 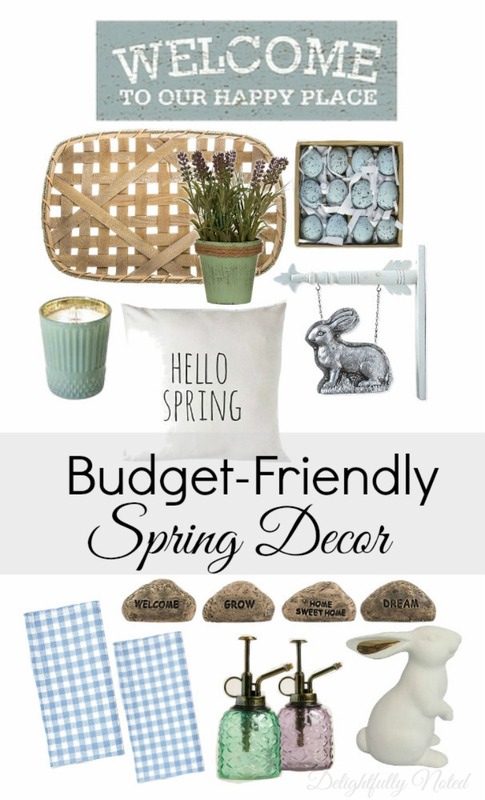 Here's a few other budget-friendly spring decor items I've been eyeing that I think you may like too. Outside of one or two items, they're all under $25! Any favorites? I'm in love with the rabbit arrow and gingham napkins! Periwinkle was our wedding color, so I'll always have soft spot for anything in that hue. Yes, even a periwinkle opossum, I suppose. I do however need to take a moment to pay respect to that tobacco basket. I picked one up for $8 at Hobby Lobby a few weeks ago and for any of you who are familiar with what it costs to purchase an authentic tobacco basket (pretty much an arm and a leg and a lung), then you'll know this is seriously the deal of the century! You can adorn it with a small spring wreath for the season and change it out for the fall and winter. So versatile. 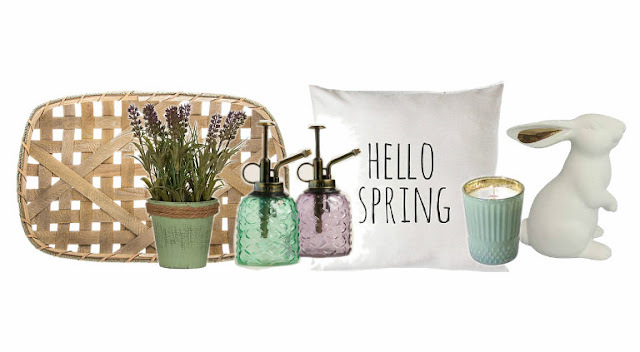 Well I hope the subject of spring in today's post put y'all in good spirits. Now....if only we could get Mother Nature on the same page. 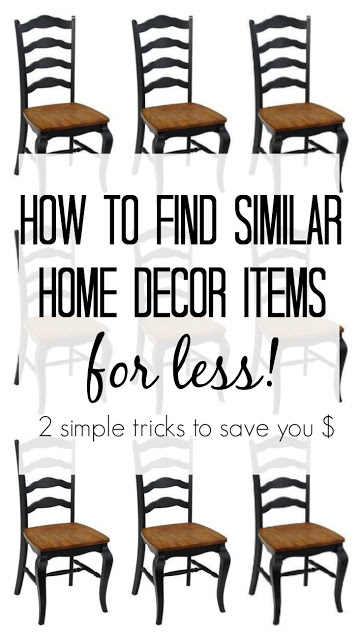 If you like money and decorating, you'll want to check out these tricks to finding your favorite home decor for less! I love the white bunnies from Target. I found a sitting candy dish for $3 ceramic bunny that looked very similar to the $15 porcelain one in their dishes section. Even my 7 year old daughter said "why buy the expensive one when they look identical?" Smart girl! The $3 bunny is sitting on my dining room table, ready for candy (but I'm not and neither is my 3 year old son who eats everything). He may get a plant instead!